Adventures & Outings is simply amazing! I’ve had a lot of “firsts” with BORP, but never in my wildest imagining would I have pictured myself on a horse-drawn carriage. 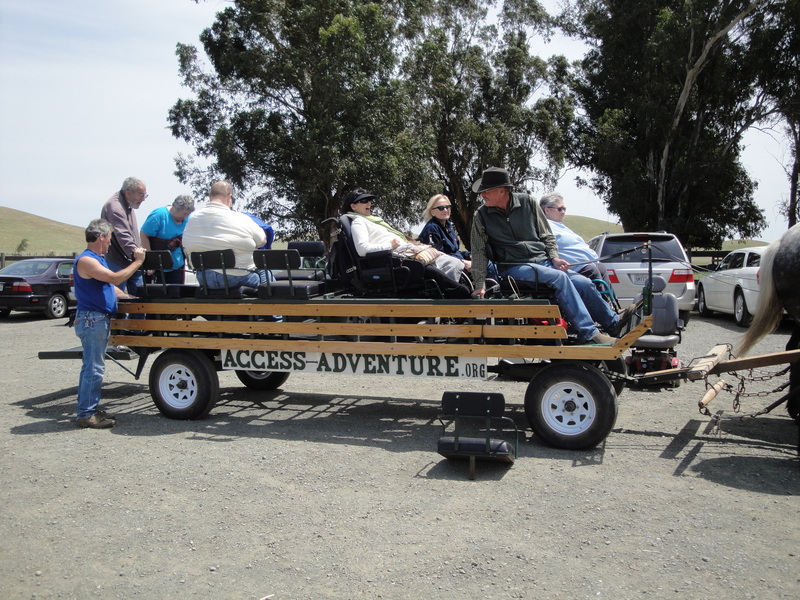 Nonetheless, there we were near the Suisun Slough with Michael Muir’s Access Adventure at Rush Ranch. It was so exciting to meet a direct descendant of one of the 19th century’s renowned Naturalist, John Muir. Michael Muir is John Muir’s great-great-great grandson. Our excursion began when we hit Grizzly Island Road along the rolling golden hills. As we came across a sign that said, “Welcome to Access Adventure” we saw cattle grazing nearby. The BORP bus pulled into a parking lot near the stables where the majestic Percheron horses were hitched up to the carriage. When the A & O gang spilled out of the bus, we were greeted by a man who stood six foot tall, with salt and pepper hair, and blue eyes that sparkled as he told us Access Adventure’s story. Michael Muir’s connection with disability and Nature is profound, not only is he the descendant of John Muir, he also lives with a condition called Multiple Sclerosis. So, he strives to make Nature accessible to all. The time soon came to load our wheelchairs, canes, and canine companions onto the carriage. We boarded one-by-one as we rode a solar-powered hydraulic lift. 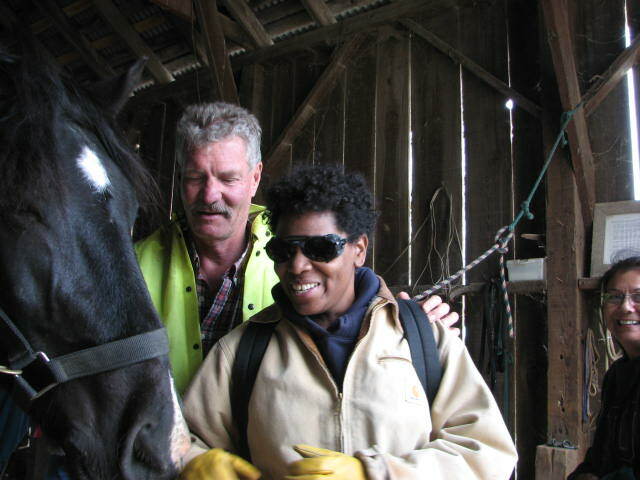 Bessie and Charles, the beautiful Percheron horses, were harnessed to the carriage waiting to take us on a tour of Rush Ranch as Michael grabbed the reins. When we ventured to explore the Ranch, we passed the stables and trespassed onto the golden pastures among the cattle. As we left the cattle behind, Mr. Muir maintained a slow trot to the base of a steep hill where there was a re-creation of a Patwin tribal village. Then Bessie and Charles pulled our carriage up the hill for a bird’s eye view of the lush green marshland. We saw patches of teal, magenta, and rust along the Suisun slough. The ride was so bouncy my friend’s wheelchair popped a few wheelies. Our ride down the hill was a lot smoother as we headed back among the cattle and meandered passed the stables. Exiting Access Adventure headquarters, the horses’ shoes began clicking on the pavement. The sound of the slow trot took me back to a time when one could actually feel the passing of twenty-four hours. Naturally, my romanticized notion of simpler times was probably wrong, but I was grateful for the indulgence. 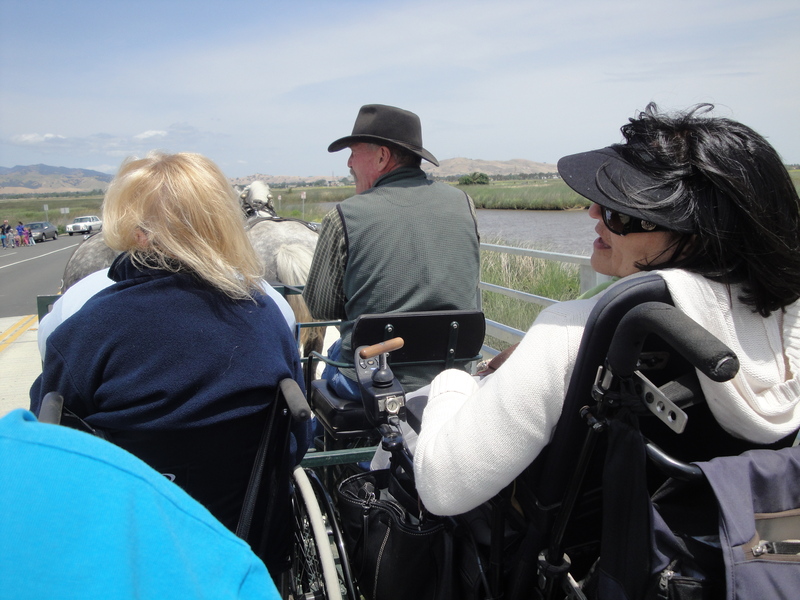 Muir guided the horses down a quarter mile to the Suisun Slough overpass. Along the way, we saw Red Winged Black Birds and Starlings as they fluttered among the golden pastures, and Jack Rabbits scurried about for shelter from Turkey Vultures. Once we crossed the overpass, Bessie and Charles stopped traffic as they u-turned our carriage. The trip back to Access Adventure indicated that it was time to leave this wonderful experience where the serene sound of clicking horse hooves took me back to an age of innocence. I left Access Adventure with a refreshed empathy for the souls who came before us.